On Monday, attorneys filed motions to dismiss all criminal charges against the Kings Bay Plowshares in federal court in Brunswick, Georgia. The seven Catholic defendants are “charged with three federal felonies and one misdemeanor for their actions in going onto the Naval Base at Kings Bay Georgia and symbolically disarming the massive amount of nuclear weapons at that base.” The group states that their actions are “to make real the prophet Isaiah’s command to ‘beat swords into plowshares.’” The seven are: Mark Colville, Clare Grady, Martha Hennessy, Jesuit Fr. Stephen Kelly, Patrick O’Neill, Carmen Trotta and Elizabeth McAlister (the widow of Philip Berrigan). See legal update on the case: KingsBayPlowshares7.org/impact. “Professor Francis Boyle, a renowned Harvard Law graduate and professor of law at the Illinois College of Law, advised the court that nuclear weapons are flatly illegal and the actions of defendants are in full compliance with the law. “Captain Thomas Rogers, a retired career Navy commander of nuclear armed submarines, told the court that nuclear weapons violate the principles of the laws of war and are both illegal and immoral. 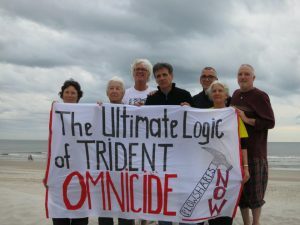 “Catholic Bishop Thomas Gumbleton declared that the actions of the Kings Bay Plowshares are totally consistent with and supported by Catholic social teaching that any use or threat of use of nuclear weapons is totally immoral. “Jeffery Carter, Executive Director of Physicians for Social Responsibility, explained to the court the fact that his organization and the American Medical Association condemn any use of nuclear weapons because of the horrific impact upon millions, perhaps even billions, of people. Also, see coverage of Plowshares movement in the National Catholic Reporter.